I have no idea why at all but I have been told on a number of occasions over the years that bad luck follows me around. As I had not been around any calamities for at least a day or two I should have realised that something unexpected was about to happen and indeed it did. The day had started like any other, nothing unusual, up at around 6 and quickly out to take care of the animals. Each day I work through a routine, which used to start with the pigs, but now it’s the ponies who are looked after first. We then move onto the goats, the ducks and pet hens and then on to the sheep, the laying hens and then the highland cattle and finishing off with time to give the dogs a good run out before breakfast. Everything was moving along nicely and I was well down the menagerie list and with the sun now rapidly on the rise, it was turning into a cracking day, or so I thought! After dealing with the sheep, I glanced over to the cattle, whom I would be visiting shortly, but something appeared out of place. Without fail, each morning, I am met with a welcome party at the field gate, with Monica, Lyndsey, Flora and Morag all lined up and ready, to greet their breakfast. Well, for some reason, today was different, there were only 3 of them at the gate and Flora was missing. Where was she? I quickly cast my eyes across the field, scanning all four corners… one, two, three and before I got to the fourth corner I spotted her. She was loitering beside the race gate, which the cattle often use to take care of those hard to reach itches. The thing was though, she was in the far field and couldn’t reach the gate itself to get a scratch anyway and besides Flora is keen on her grub and is normally first over to greet me and so this was unusual, especially for this lady and so I was confused to say the least. I dropped everything and ran across the field to get a closer look and before I had got half way over, my running slowed to a walk. In fact, my concern had turned into laughter as I could see exactly what her problem was. I’ll explain, the fence which runs alongside the front of the race has a half rail removed, to allow the crush gate to open and close easily. 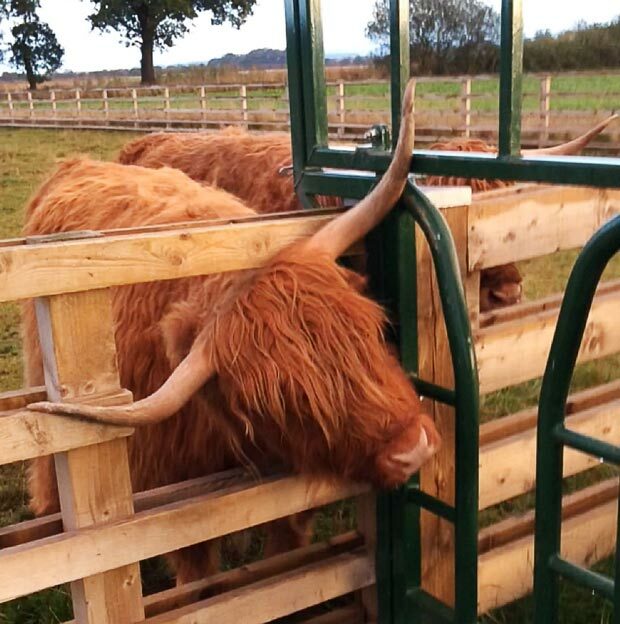 Well, with this half rail missing it has created a gap just big enough for a two year old highland cow to somehow squeeze her head through to nosey at the grass in the neighbouring field. The problem was, once through, it wasn’t nearly as easy for her to get her head back through that same hole, as I was about to find out. Have you ever tried pushing a Highland cow back through a hole that wasn’t quite big enough to get their horns through. Take it from me, it’s not easy! As I pushed one way, she pushed the other, as I turned her horns vertically, she wanted them horizontal. For some reason, it just made me think about when Mrs. Jenkins tried to retrieve a ball of plasticine from up my nose, in primary school, with me doing anything but cooperating with her. Anyway, eventually, I just had to turn to brute force to sort the situation out, and show her who was boss. I’m sure she’ll thank me for it one day.